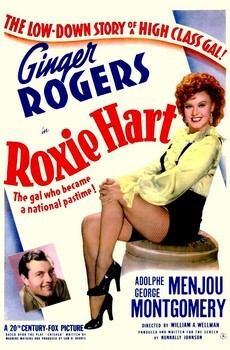 Roxie Hart (Ginger Rogers) was a wannabe show girl whose husband shot and killed a talent scout who was in their apartment making a pass at Roxie. A reporter and another talent scout know what type of town Chicago is – the kind of town where violent chippies like Roxie never swing for killing a man. In fact, they not only beat the rap, but they also become celebrities! The reporter realizes that with her looks, this could be the biggest story he’s ever covered while the talent scout suddenly realizes that she might have enough talent to be a star. They just need her to admit that she’s the one who killed the guy! Roxie, recognizing a sweet deal when she hears it, eventually agrees to have the murder beef pinned on her in hopes that it will launch her career. The talent scout produces a piece of paper and tells her to sign it so that she’ll be under contract. She looks at it, discovers that it’s completely blank and says that there’s “not even any fine print” on it. The talent scout tells her that he’ll fill that in later thus setting the tone for a film that’s a farce of epic proportions full of bitterly funny commentary on the press, the legal system, and the ego of people who seek fame. Roxie owns up to the crime she didn’t commit and is taken to the county jail, becoming the celebrity she and her advisers (the reporter and the talent scout) had hoped for. 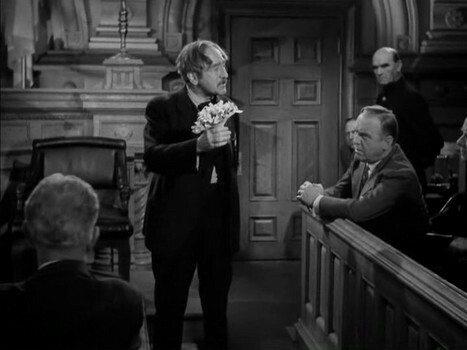 Billy Flynn (Adelph Menjou) signs on to be her defense attorney. He’s a complete operator and you just know that some of the stuff he engages in with his client, is exactly the sort of thing that a lot these lawyers do with their high-profile celebrity customers. He tells her what their defense will be before even knowing the facts (it’s self defense – we’ll figure out why later) and instructs her on how she should act around the press. Roxie wants to be a star even though she is in lockdown and in another funny scene she allows herself to be talked into demonstrating some dance she’s well known for and the next thing you know, she and all the reporters with her at the jail, break out into a big dance number! Everything is going swell for Roxie until Two Gun Gertie is captured. She’s a rough and tumble blonde who is all attitude and Roxie is quickly relegated to yesterday’s news! Roxie is determined to be the biggest name in the biz though, so she announces she’s pregnant! This immediately brings the press back to her side and whips everyone into a frenzy of pro-motherhood sentiment while Flynn wonders how the state can charge one person with a crime, but try both Roxie and her unborn child for it! The reporters even decide that the trial should begin on Mother’s Day to maximize the publicity. Meanwhile, Flynn gets Roxie’s husband to divorce her in an effort to further portray Roxie as a hapless and helpless victim of a cruel and unfeeling male-dominated world. As funny as the first part of the movie was, the last part is what really brings everything home. This is where Roxie goes on trial for murder and it is probably one of the funniest trials you’ll ever see. No one involved is spared satirical dissection and this is another one of these ancient movies that still works because they were on the money with so much of their material. 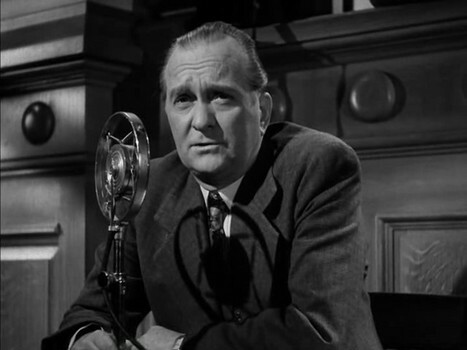 The trial is being covered by a radio guy doing the play by play and a crime reporter providing color commentary and it’s all brought to us by some quack doctor selling some kind of home remedy decades before cable channels did basically the same thing! 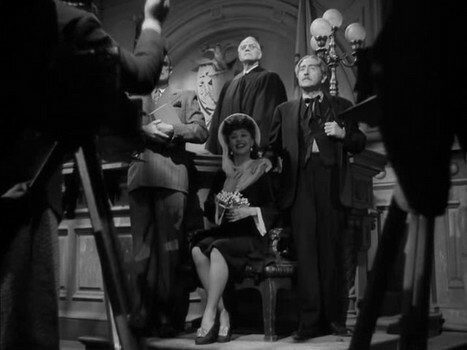 The filmmakers engineer a constant barrage of biting humor throughout the trial, with Roxie flirting with the jury, the reporters stopping the action at dramatic moments so they can photograph Roxie who is posing on the witness stand, right down to the publicity-hound judge who always rushes from his chair to pose majestically in the back of the photos with Roxie. The reporter who is giving the color commentary probably has the best line in the movie when Roxie testifies that she tried some liquor and that it must have been whiskey because it tasted so yucky. “It’s loose talk like that that gives whiskey a bad name,” he intones to his listeners earnestly. The trial continues until finally Billy gives his closing argument and eventually has to tell Roxie to shut up because her fake crying has gotten so loud that nobody could hear his impassioned plea for mercy. By the time he turns to the judge, holding the by-now passed out Roxie in his arms, and tells the Court that the defense rests, you’re worn out by all the hi-jinks. There is a rather half-hearted attempt at a love story and the very end of the movie that takes place years later back at the bar doesn’t really work, but that’s the only quibble with this picture and I only note it, because they could have just ended it all with the verdict. That unnecessary padding notwithstanding, this movie is one of the funniest parodies of our legal system to ever grace the big screen. An underrated screwball classic that will leaving you shaking your head in laughter as well as disbelief at how little has changed in the ensuing years.